Articulate Storyline supports scoring for correct responses and incorrect responses. You can even use negative point values for incorrect responses to give learners more nuanced scoring. 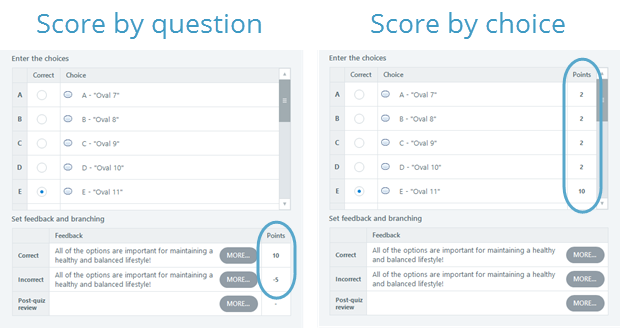 By choice: This option lets you assign a different score to each answer choice. It's only available for some question types, including Multiple Choice, Word Bank, Freeform Pick One, and Freeform Hotspot. To actually assign point values to correct and incorrect responses, you'll need to switch to Form View.